One of the leading suppliers of simulated pearls, Elvee/Rosenberg has a huge selection of glass and plastic pearls. 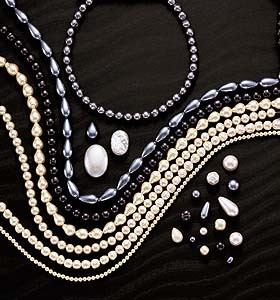 Smooth or baroque pearls; round, oval, or teardrops; cabochons, no-hole or half-drilled pearls available in white luster, cultura, or gunmetal finishes. Immediate delivery. Dyeing available for special colors, and custom orders are welcome.